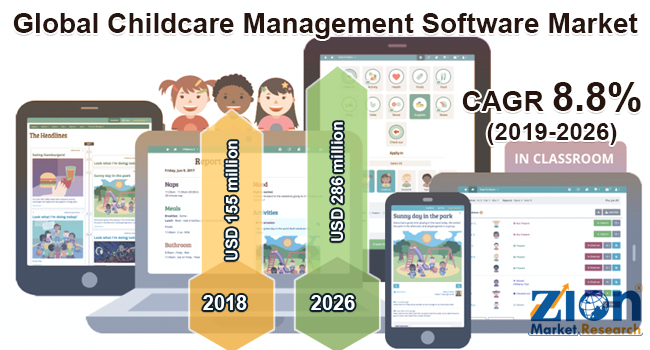 Global childcare management software market expected to generate revenue of around USD 286 million by the end of 2026, growing at a CAGR of around 8.8% between 2019 and 2026. Childcare management software is also known as child care administrative software or daycare accounting software. The report covers forecast and analysis for the Childcare Management Software market on a global and regional level. The study provides historical data for 2018 along with a forecast from 2019 to 2026 based on revenue (USD Million). The study includes drivers and restraints for the Childcare Management Software market along with the impact they have on the demand over the forecast period. Additionally, the report includes the study of opportunities available in the Childcare Management Software market on a global level. In order to give the users of this report a comprehensive view on the Childcare Management Software market, we have included competitive landscape and analysis of Porter’s Five Forces model for the market. The study encompasses a market attractiveness analysis, wherein deployment segment, solution segment, and end-user segment are benchmarked based on their market size, growth rate, and general attractiveness. The report provides company market share analysis in order to give a broader overview of the key players in the market. In addition, the report also covers key strategic developments of the market including acquisitions & mergers, new product launch, agreements, partnerships, collaborations & joint ventures, research & development, and regional expansion of major participants involved in the market on the global and regional basis. Moreover, the study covers price trend analysis, the product portfolio of various companies according to the region. The study provides a decisive view on the childcare management software market by segmenting the market based on deployment, solution, end-user, and region. All the segments have been analyzed based on present and future trends and the market is estimated from 2019 to 2026. The regional segmentation includes the historic and forecast demand for North America, Europe, Asia Pacific, Latin America, and Middle East & Africa. This segmentation includes demand for Childcare Management Software market based on all segments in all the regions and countries such as UK, Germany, France, the U.S., and China among others. On the basis of deployment, the market for childcare management software is bifurcated into on-premise and cloud- based. Considering the solution segment, the market is divided into family and child data management, time and activity management, nutrition management, attendance tracker, employee data management, payroll, accounting, and others. Based on the end-user, the childcare management software market is divided into parents, daycare centers, and play schools. Some of the major players present in the childcare management software market are AIS Software, Childcare Sage, CIRRUS GROUP, LLC, EZChildTrack, HiMama, Jackrabbit Technologies, Kangarootime, Kids Note, Inc., KidReports LLC, KINDERLIME, Kindertales, LifeCubby, Orgamation Technologies Inc., Personalized Software, Inc., Procare Software LLC, Sandbox Software, SmartCare, SofterWare Inc., TimeSavr, and UNIFA Corporation among others.